Get Clear HD TV Signals with Clear TV Key! Clear TV Key allows you to pick up TV signals from just about anywhere! The sleek design installs easily- simply plug into your digital TV and you are ready to go. 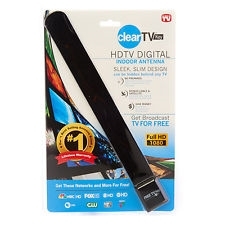 Clear TV Key, As Seen on TV, is the TV antenna that captures free TV signals without the high cost of cable! Clear T Key features a sleek design that easily installs to any digital TV. No tools or programming required. Just plug into the back of your TV and you're ready to go. No cable bills, no hidden fees.